Today I have a Christmas version of the witches hats that I shared in my last post. They’re not in hat form but are a rather sweet favour that would dress up a Christmas table beautifully. I used the Pyramid Pals Thinlits to make the boxes in Basic Black and Very Vanilla this time and added a rosette made from the This Christmas Specialty DSP. (Tip: This DSP is a lighter weight than our usual DSP so I used a scrap of Very Vanilla to hold my rosette together and then added the DSP circle on top after they were dry). Merry was die cut from Gold Glimmer paper using the Christmas Greetings Thinlits and the sentiment from Holly Jolly Greetings was stamped on a 3/8″ strip of Very Vanilla cardstock in Momento Black Ink and both ends flagged. I adhered the bottom of the “Merry” to the sentiment and added that to the rosette with dimensionals. A smattering of tiny stars from the Mini Treat Bag Thinlits adds the final Christmassy touch. I scored the back at 1-1/2″ to make a little flap for easy access but you could seal them up completely if preferred (I’d hate to see them torn open so I think the flap would be my option). These boxes are quite small measuring 2-1/4″ (5.7cm) square at the base and 2-3/4″ (6.8cm) high but more than big enough for a special treat or the quirky little gifts that I know we like to have at our Christmas table. One advantage of their size is that you could have one at each place setting and they wouldn’t crowd what is usually (at our house anyway) a very full table. I really like the cream, black and gold colour combination, I think it’s very elegant, but you could easily change the colours to suit whatever Christmas colours you love. That’s one of the lovely things about DIY, you can customise your projects to suit just about any occasion and colour scheme you can think of. I hope you like my Christmas version and I have one kit to give away. If you’d like to win, just leave a comment on this post and I’ll announce the winner next Friday (available to Australian residents only). A final note before I sign off, all the products used in todays project are available to purchase from the Annual Catalogue. 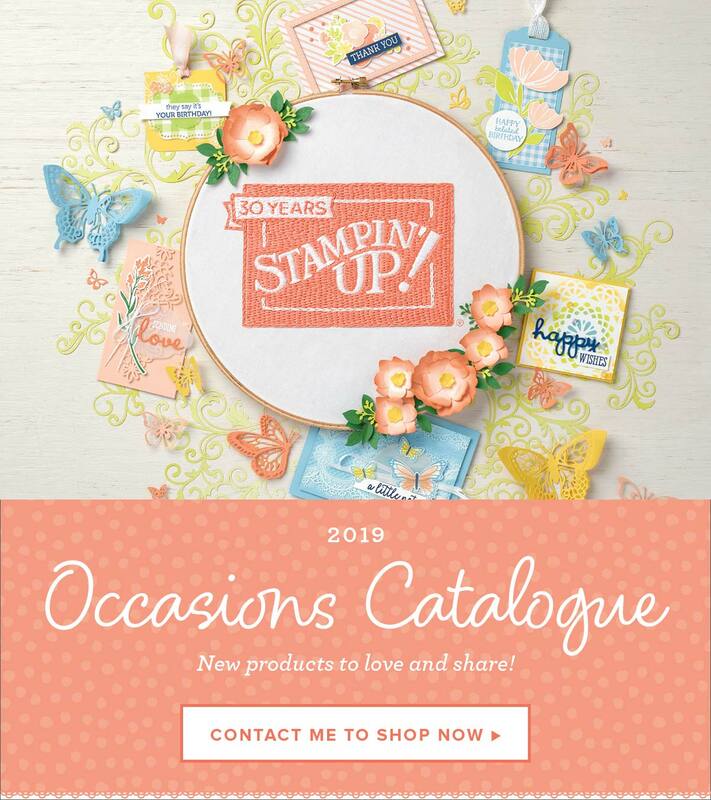 Although the new Holiday Catalogue commences soon (and there are some gorgeous things in there!) there is quite a nice Christmas selection in the current catalogue that is well worth a look.